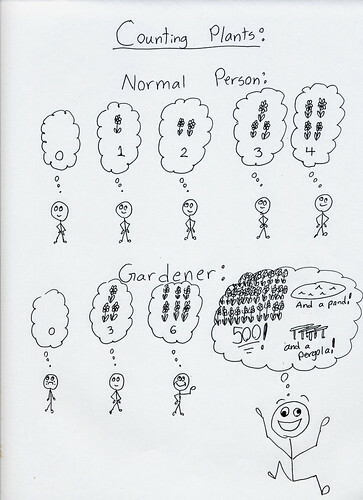 I, like many others, was laughing out loud when I visited May Dreams Gardens yesterday and read Carol's "Gardeners guide to quantities" So I decided to create some drawings to illustrate the principles Carol set forth so clearly. 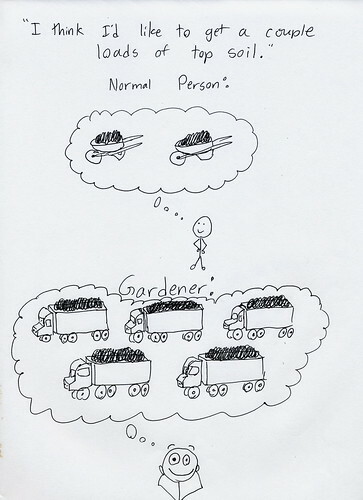 Next A drawing illustrating the fact that for gardeners, the smallest quantity of plants we're capable of thinking of is 3. 1 and 2 just don't exist for us. LOL! Now that is true and so funny. I am so bummed out about the African Violet leaves. I did not know the variegated leaves would grow green plants.Thanks for letting me know, I think ;-) I guess I should have just bought the plants after all.Drat! Now you know why variegated african violets are so expensive! And the day brightens... Popped over from Hocking Hills... This is hysterical. I love it!! Oh my goodness, this is a funny post! How come it took me so long to find this!! I am going to immediately subscribe to your blog and tell everyone to come and see this. You have captured perfectly what I was trying to say! Our favorite words: bulk discount! How did you know I wanted a pergola? Carol sent me. This was hilarious. Like looking in a mirror. Hilarious. I really did get that "couple of loads" of topsoil. It's still in my driveway...I've been moving it for months. As a very visual person (aren't all gardeners?) I really enjoyed your interpretations. LOL Very amusing although I must admit that I do buy just one plant from time to time. Too funny and too true! Thanks for the laugh! LOL, I can certainly relate to that last drawing:) My husband was surprised the other day to see a big patch of lawn dug up; he said, "I thought you were just going to plant a FEW flowers." Obviously, he doesn't understand gardener language. Wow! your drawings are so awesome!